i was completely in love with Bret Michaels in jr high. but, suffice it say, my bedroom walls were plastered with pictures of bret michaels and sebastian bach in 7th and 8th grade. my best friend, Lynn, and i, throughout most of our early friendship, had polarized stances on our favorite bands. i loved Poison, and she loved Motley Crue. she loved Metallica and i leaned more toward Guns N' Roses. this later evolved into Danzig v Type O Negative. eventually, we wandered into goth and found more mutually agreeable things like The Sisters of Mercy. 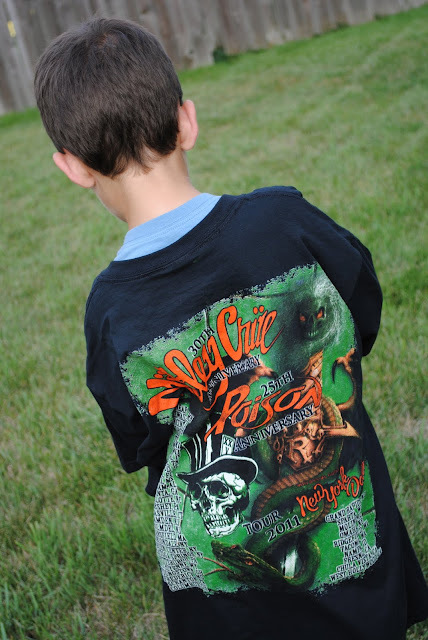 but, back in the beginning, our dedication to Poison and Motley Crue was strong. unfortuately, our bands did not mix. quite frankly, "the crue" looked down on my beloved poison. here is an article on the bands' feud. but, our love of going to concerts was also very strong. i have some good stories. just not for this blog. we would have loved to see them tour together, but we knew it was simply not going to happen. until i was recently stopped by Ziya and Myka's dad in the daycare parking lot while picking up ben on a thursday afternoon. he works at our large event center on campus. and had extra tickets to THE POISON AND MOTLEY CRUE SHOW that friday night. did bern and i want to join he and his wife? my brain literally went through about 83 thoughts in the 2 seconds i had before it is socially acceptable to respond to the person in front of you. Oh my goodness, i didn't even know they were touring. i have to call Lynn! i haven't called Lynn in a long time. god i stink at long distance friendship. do bern and i want to go to this show? bern probably doesn't care about this show at all. he skipped this genre. but he loves me and will humor me. but, OH MY GOD, we are leaving for california on saturday. and i have to pack the boys and i for an 11 day trip. shoot, i still need to get anth the goggles he wants. maybe hit the travel section at Target. i CAN'T go to this show. i mean, it is hard to capture it all because it happened so fast, but literally, my mind was racing. and because i actually did have to work with bern to get our lives in order to leave for a big trip, i told Mike i couldn't do it. it may have broken my 8th grade heart a little bit. but, yesterday, i got a call from bernie on my way in to work. "hey, krys. i think Mike might have left something here for you." 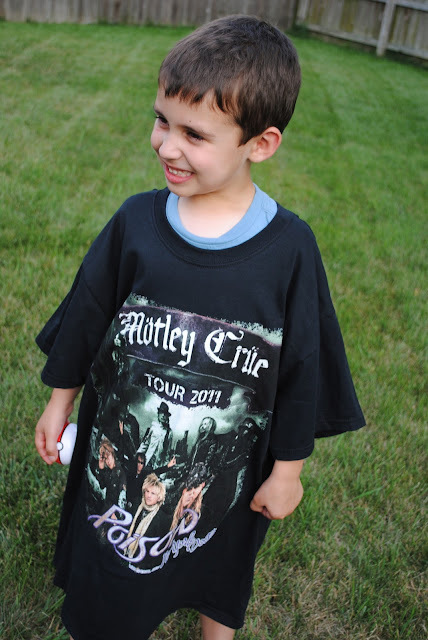 "because there is an adult sized Poison/Motley Crue shirt in ben's mailbox." and then i got off the phone. and proceeded to explain the fued between the two bands, and that Auntie Lynn and i used to love both of them and thought they were never going to perform together, but that they had, and i missed it, but that Ziya's dad gave me a shirt with BOTH bands on it. the moral of the story i was trying to convey to anth while wondering if the tee had logos or pictures of the band members on it? you never know who will surprise you. even glam/metal bands can provide you with totally Disneyish, When You Wish Upon A Star moments. and even your dorkiest dreams can come true. you just might have to wait 22 years. anth was essentially nonplussed, and responded with, "i bet it will be a really cute top, mom." clearly, he didn't get the message. but, in this context, it is a pretty cute "top."